The Bacofoil Zipper Bag Challenge! So, I am all about the home hacks, anything to make life easier when you have a six year old constantly hanging off your leg asking you to be Batman. Time is not the friend of a busy parent! 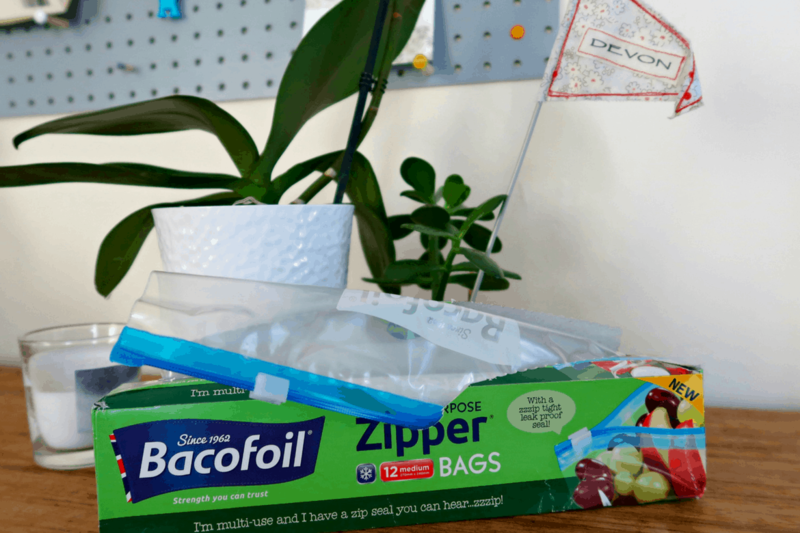 A great all-rounder in the kitchen, and for the rest of the house; indoors, outdoors, rain or shine the Bacofoil All Purpose Zipper have so many uses. You can buy them in two sizes, the bags are thick and tear proof (aka kid proof) reusable, secure and best of all convenient (promptly chucks the cheap sandwich bags and cling film in the bin). There are literally hundreds of uses, here are our top 20 (ish)! Want to stop sticky fingers ruining your tablet or phone in the kitchen? If your little ones are helping you cook put the device in the Bacofoil All Purpose Zipper Bag, smooth out the air and seal. The touch screen will still work and you will not have to make a stressed call to the insurance company when the IPhone has a bath in apple juice. You can read recipes or children can play Angry Birds whilst making rice crispy cakes! Offering space for the perfect portion sizes with Bacofoil All Purpose Zipper Bags you can either fill them with leftovers or bag up with meals for the week after a Sunday batch of cooking. A plus point is the bags take up much less room than Tupperware boxes. Hands up who else has the world smallest freezer?! The secure Zip Tight Seal feature means you don’t get any sneaky leaks. Make use of the label area to jot down when food was frozen! Mary Berry would tut at my hot hands which means dough and pastry melts on my fingertips in 3.4 seconds. Not the type to have a stash of plastic gloves on hand why not use the bags over your hands, zip them to your wrists and knead away! Not just for frozen foods these bags are incredibly versatile! The re-sealable feature means they are perfect for locking in freshness. For example if you are a bit heavy handed like me your salad bags never survive after the first opening. To avoid wilting lettuce why not toss your salad into a perfectly sized bag. Similarly why not use it in the fridge to store grated cheese or anything else you don’t want to dry out. Possibilities are endless. A little suggestion for the grownups. My son is mad for those Capri sun bags, me? I am mad for a Gin and Tonic. If you are going out for a BBQ why not pour your mixers into a bag, add lemon and ice, take some straws and hey presto, a grown up juice bag. The stand-alone base means the Bacofoil All Purpose Zipper Bags can stand up so who needs glasses?! Ice cream is always a win with children but I find sorbet easier to make at home and a fab pudding choice for those with allergies. All you need two bags, fruit juice, ice, salt and water. Oh and strong arms to shake. Steak is a firm favourite in this house and one of the tastiest ways we have found to prepare it is marinade it with soy sauce and crushed garlic overnight. Add all the ingredients to the Bacofoil All Purpose Zipper Bag, squeeze out the air and then massage the marinade into the meat after sealing the bag and leave overnight. Easy peasy. Wash in in warm soapy water afterwards and use again. Is there any cheese in cheesecake? I don’t buy premade crushed biscuits when making a cheesecake base and previously used to spread digestives all over my kitchen trying to crush them wrapped in cling film. Instead zip the biscuits in a Bacofoil All Purpose Zipper Bags, pass to your six year old a rolling pin and have a cup of tea! Storing salt dough or homemade playdough. Salt dough is one of my go to rainy day saviours. All you need from the cupboard is salt, water, flour and an oven if you are patient or two minutes to dry the mixture in a microwave if you are not. I usually whip up the mixture early morning or the night before and to stop it drying out use one of the bags! Let’s face it with all the stuff we have to drag around for our kids there is very little room in our backpacks. Use the Bacofoil All Purpose Zipper Bags to pack sandwiches for the beach, send in snacks for school (use a marker to write on your littles names!) and for the perfect picnic. Worried about foods getting squished or bruised? Simply blow up the bag a bit and let the air cushion your strawberries! Eggs, especially poached are my nemesis. A bit of cider vinegar, stirring a whirlwind, adding slowly. Nope, no can do. Instead pop a bag in a cup pour in an egg, remove bag and twist just above the egg then pop it into the boiling water! Don’t make the same mistake as me and pour used cooking oil down the drain. Wait for it to cool, pour it into a bag and seal. You can throw away immediately or to be more environmentally friendly store the bag under the sink or in a safe place and keep using it until full. The volume of the bags will mean it can last for months. It will save you money on a plumber! Melting chocolate on the hob often results in a very a messy bowl or pot to wash. Instead put the chocolate in a bag, then into the boiling water, you can then snip the corner once its melted for an easy pour! You can still lick the bag. The bags are not just a godsend in the kitchen but also for everyday parenting, below are our top mum hacks. Why not make a stained glass window? Grab some poster paints open up the zip bag, get messy and let things dry! Simple as! Fill with ice and put on bumps and scrapes for sore knees and elbows. Keep a bag in your purse and then if your littles have any potty training accidents you can store the clothes and keep any nasty smells contained. Does anyone else accidently rip open wet wipes? To stop them drying out why not slip the pack in an easy accessible zip bag! To stop spillages stick the suntan lotion or squash bottles in a bag for an easy trip. Also for older children that don’t travel well it can double up as a sick bag that can be easily sealed up. For safety I wouldn’t leave little ones unsupervised as it is plastic but it saved my six year old when we were caught without a bowl! Who else has 100 different bits of craft gear in their home? Sequins, mini poms poms, glitter. Check it in a bag to avoid it getting lost or stuck in the carpets! If you are storing children’s clothes in vac seal packs or boxes in the attic, why not keep things fresh by filling a bag with lavender, and punching a few holes in it. It might also help in your other half sock drawer. My all-time favourite use for bags. My son gets given so many different Lego sets and the boxes never survive, so in his Lego drawer once we have built up a car it goes back in its bag with all its bit so when he eventually smashes it up we can find all the pieces without having a nervous breakdown! Have you got any other useful ideas and used for the Bacofoil? Have you used it as a temporary make up bag? To steam cook salmon? To cover your car mirrors when it is icy? We want to hear all your tips and tricks!